The saying goes that “money doesn’t buy happiness”. I firmly agree with this however I think the saying is also a little misleading and should be extended to say “money doesn’t buy you happiness but without a certain amount it’s going to be very difficult to be happy”. Thankfully, I am not in the situation where I am heavily indebted or worse am heavily indebted and require the booming pay day loan industry to get by. I can only imagine the pressure and stress that a life like that would put on both an individual and their family. It is for this reason that I believe a basic level of personal finance should be taught at school. What good is English, Mathematics, Sciences and the Arts if the earnings potential that those skills bring cannot be harnessed and maximised. 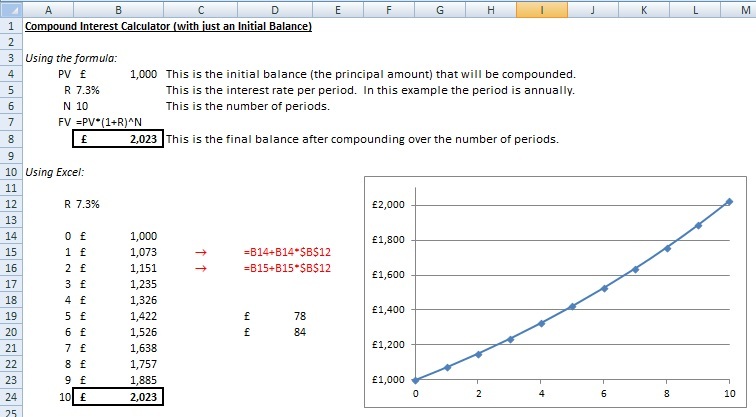 Within the personal finance module it would be compulsory to teach the miracle of Compound Interest. I can’t help but feel that we would have less indebted people today in the UK if only more people understood how Compound Interest worked. The sad thing also is that at its most basic form Compound Interest is such a simple concept. It is nothing more than if you have an initial balance of money which has interest added to that balance, then provided you don’t withdraw that interest, from that moment on that added interest also earns interest. It is nothing more and nothing less than that. Let’s now look at the mechanics of that simple Compound Interest theory. Let’s say we have £1,000 as our initial balance and our balance receives annual interest of 7.3%. At the end of the first year we have earned interest of £73 which makes our balance £1,073. If we don’t spend that £73 and leave it right where it is then at the end of the second year we won’t receive £73 interest but actually £78. Repeat again for another year and the interest is now £84. 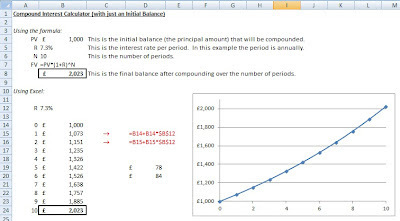 The image below shows a screen grab of a simple Excel sheet that enables you to calculate the effects of Compound Interest using the example above. The top section shows how to calculate Compound Interest if you are mathematically minded. The formula is FV=PVx(1+R)^N where FV is the final balance after compounding, PV is the initial balance, R is the interest rate per period and N is the number of periods. If you’re not mathematically minded then the bottom section of the image shows how you can calculate Compound Interest without needing to remember the formula. I actually prefer to use this method as it means that you can graph the results which I feel is an extremely powerful way to show the power of Compounding. Can you see how the graph starts to really gain traction at about year 4? Let’s now add a little more complexity. Instead of just an Initial Balance we are also now going to assume that we want to make regular periodic (in this case annually) additional contributions. The results are shown in the image below where we introduce additional annual contributions of £100. 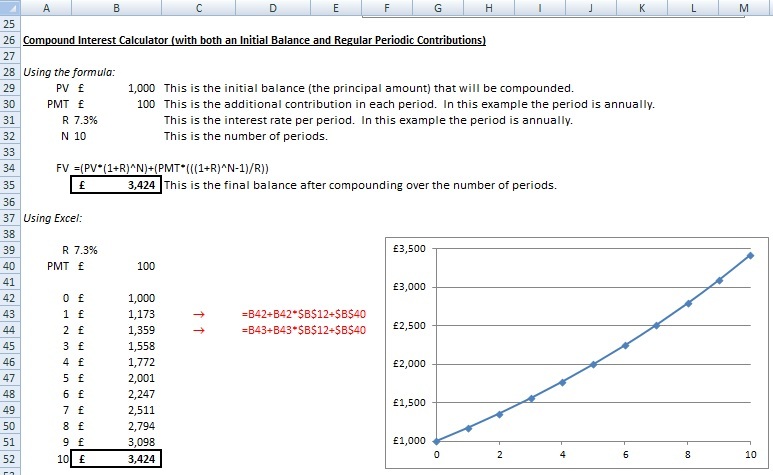 If you want the formula then the first half of the formula is the same as above but now you just have to add the regular additional contribution effect. The formula becomes FV=PVx(1+R)^N+(PMTx(((1+R)^N-1)/R)) where PMT is the addition contribution in each period. 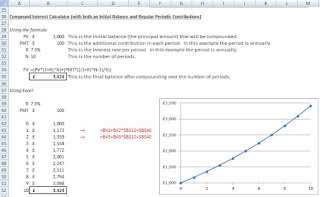 As before if you’re not mathematically minded or can’t remember the formula I also show how you can just use Excel. Let’s now see how we can use this basic theory in real life. Earlier this week I was looking for some historic information and I came across one of the pieces of information that made me go DIY with my own financial planning, thereby creating the Retirement Investing Today Low Charge Portfolio. The year was 2007 and the document was a Letter of Engagement for Personal Financial Planning Services. One positive with this particular Financial Planner was that they were reasonably transparent with their fees and would rebate all upfront/trail commissions in exchange for an initial fee and an annual management fee. The negative was that they had no interest in ever educating me (I guess that’s how they keep you as a customer) about what they were doing with my money, made it sound more difficult than I now know it really is plus as I’ll now show those fees would have been extremely damaging to my long term wealth. I don’t believe that they were deliberately misleading by making something sound more complicated than it is but when they said they would be investing in investment trusts, offshore deposits, exchange traded funds, offshore saving schemes, investment bonds, UCITs, open-ended investment companies (OEICs) and mutual funds all in one big long sentence I did feel as though they were the experts. The fees were the interesting bit. There was to be an initial fee of £750+VAT=£900 plus commission of 0.5% per annum of the total assets under management (subject to an annual minimum of £250). Additionally, he was going to use some mutual funds which had initial charges, which while a portion of this would be refunded, would still be around 2%. For the purposes of discussion today let’s assume I would have ended up with 50% of my portfolio in these mutual funds which would mean an initial charge of 1% of assets invested. I was then told that I could expect expenses of 1% per annum for the investments themselves. 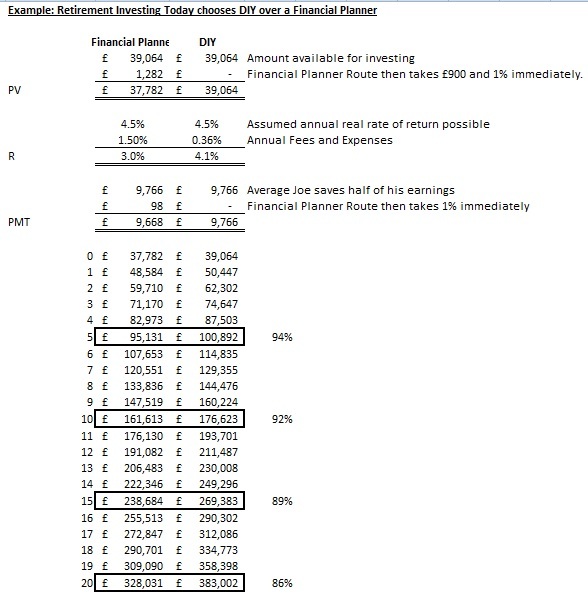 Therefore the Financial Planner route in Year 0 would have had me out of pocket £900 plus 1% of total investments, then every year after that I would have been out of pocket to the tune of 1.5% of total portfolio value. Instead I went the Retirement Investing Today DIY route which has zero Year 0 expenses and now has 0.36% of expenses annually. Let’s run these numbers through a Compound Interest Calculation for a typical Average Joe which I show in the image below. Let’s assume our Average Joe earns around £25,000 per annum which after tax and National Insurance leaves him with £19,532 per annum. Let’s assume that he saves 50% of this. Let’s also assume that in Year 0 when he had to make the decision of going DIY or Financial Planner he had 2 years of earnings, or £39,064 already saved. Let’s also assume that Average Joe’s investment mix yields him a real (inflation adjusted) return of 4.5% per annum. So let’s now move forward 5 years. It’s now 2012 and had Average Joe chosen the Financial Planner he may have £95,131 worth of asset value. Had Average Joe gone the Retirement Investing Today DIY route he could have been sitting on a portfolio £100,892. 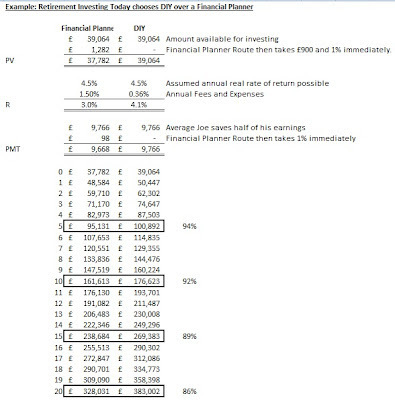 So the Financial Planner route would only be 94% of the value of the DIY route. You might say that a gap of 6% is not so bad given the convenience of a Financial Planner however this is where a lack of knowledge about Compound Interest can really hurt you. Look ahead to 2017 and that difference could be 8%, then look to 2022 and its 11%, then look to 2027 and its 14% and so on. Now think that a person’s investing career could be 70 or 80 years and you start to see why working knowledge of Compound Interest is just so important. You make an excellent point however I fear that a lot of the punters out there don't have the common sense that you mention and possess. I'm guessing Average Joe just thinks that 1% is not that bad. Maybe if it was expressed as "these fees may take 59% (1%/1.7%) of your annual return" he might think differently. Let me demonstrate with a simple example using your example as a basis. I personally buy UK Government Index Linked Gilts. I buy these from Vanguard for a TER of 0.15% and from iShares for a TER of 0.25%. Within about 2 seconds I can find a fund selling an "equivalent" which charges 4% up front followed by 1% annually (didn't get as far as checking if that was TER so it could be worse). How much damage would choosing that fund do to my chances of Retirement? IMHO a lot and so I stay away. Even though I stay away Average Joe's out there are prepared to hand over their hard earned to that manager otherwise it wouldn't exist. Now if those Average Joe's just sat down and ran the numbers in a mechanical and unemotional way as I described above they could potentially come to the right decision for them without having any common sense. Maybe that fund would be right but I'd personally doubt it. For instance, why use a gilt fund? Thanks for the great suggestion and for sharing. I'm now buying selected equities as part of a HYP to among other things drive down costs but never really considered buying my government debt in the same way. Something else for me to now investigate.